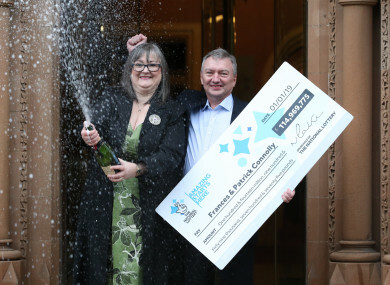 A NORTHERN IRISH couple who won the £114 million EuroMillions jackpot on New Year’s Day have been named as Frances and Patrick Connolly. The pair won a total of £114,969,775.70 (€129,645,665) in the draw, becoming the UK’s fourth-largest winners in history. The couple matched the numbers 1, 8, 11, 25 and 28, plus Lucky Stars 4 and 6, ending a long sequence of rollovers stretching back to 16 November. It was announced on Wednesday that the winners had already come forward to claim their prize, and that they decided to go public with their story rather than remain anonymous. Frances and Patrick Connolly talk about the moment they found out they were the winners of the £115m Euromillions jackpot. Patrick Connolly said that when he initially checked his numbers online he was convinced it was a scam. However, the news began to sink in after he checked the numbers on numerous news websites. He said he turned the computer around to his wife and said “I think I’ve got some good news for you”. "How do you not tell people?" Speaking about why they made the decision to go public, Frances Connolly said that “it was never going to be a secret”. “If we’d had small families I wouldn’t have minded asking my brothers and sisters to keep it quiet for a while, but … nah,” she said. Email “'I've got some good news': Northern Irish couple named as €130m EuroMillion winners”. Feedback on “'I've got some good news': Northern Irish couple named as €130m EuroMillion winners”.